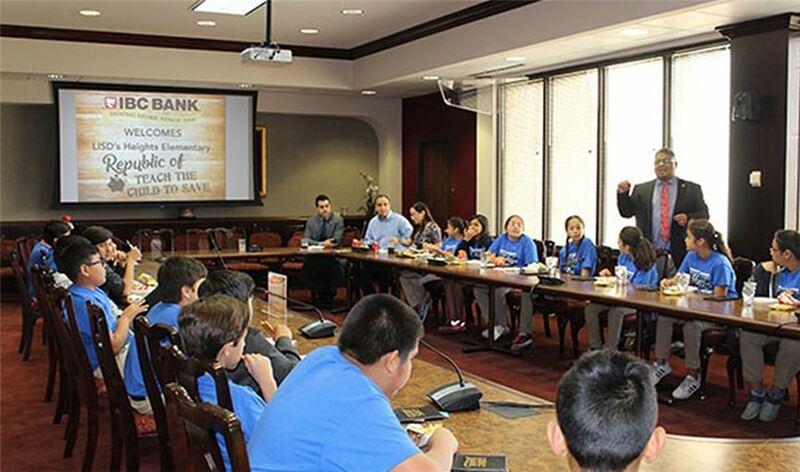 LAREDO, TX (April 6, 2018) - In honor of Financial Literacy Month, IBC Bank-Laredo hosted 37 fifth grade "Trailblazers" from Heights Elementary School for the bank's first ever "Republic of Teach The Children To Save" event where they learned and experienced real-life financial literacy scenarios. The event took place at the IBC Bank community suite. At the event, students stopped by various booths where they could make a variety of imaginary expenditures, including on consumer goods, mortgage and rent, restaurants, insurance, utilities and taxes. Students worked with a fictional budget of $5,000 per month. When they had finished spending their money, they stopped by a bank and calculated how much they had left over to be used for future spending, savings and investments. "It was such a thrill to see the excitement and curiosity on the faces of all those students learning first-hand how to be careful when spending money - and most important, how to save it," said Margarita Flores, IBC Bank vice president of corporate marketing. "The lessons they learned at our fun event will last them a lifetime." After students went through the financial literacy exercise, they listened to bank officers give tips on how to save money and learned why saving for the future is important. Students also were given a tour of the bank where they saw the IBC Bank vault and larned about sales and international banking. IBC Bank-Laredo is a member of International Bancshares Corporation (NASDAQ: IBOC), a $12.2 billion multi-bank financial holding company headquartered in Laredo, Texas, with 192 facilities and more than 294 ATMs serving 87 communities in Texas and Oklahoma. In 2016, IBC celebrated its 50th anniversary since opening its doors for business in 1966. IBC Bank's slogan "We Do More" reflects the bank's dedication to the growth and success of both the customers and the communities it serves. International Bancshares was ranked 19th on Forbes' prestigious list of 100 Best Banks in America in 2018. IBC Bank-Laredo serves the community with a retail branch network of 20 locations. In April 2017, IBC Bank-Laredo was selected as "Best Bank" in the Laredo Morning Times Readers' Choice Awards. MEMBER FDIC / INTERNATIONAL BANCSHARES CORPORATION. Visit us on our YouTube channel, IBCBankWeDoMore. More information is available at ibc.com.